This is a very bad thing to start playing at 11:30 on a Sunday night. Google & Sony have created a game that is embedded right in your Google homepage. 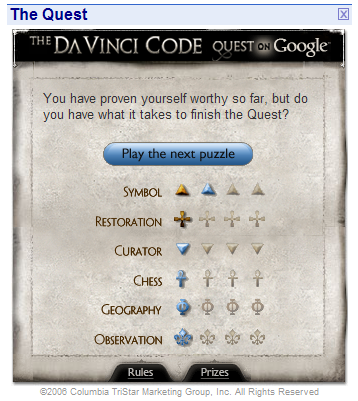 It's little mini puzzles that generally require a piece of information that you need to get from the official Da Vinci Code Movie Site. Steve Rubel has a bit of write up about it.